As visuals from Kendrick Lamar’s DAMN and Flavour’s Ijele, The Traveler album continue to roll-out, the importance of the art of videography is restated for music of any genre. Investing in music videos through artistry and content goes a long way in improving the longevity of a song. And over time, artist have realized that a well choreographed dance video can make a video iconic enough to stick. Fuse ODG’s new song, “No Daylight” is produced by Killbeatz with a pacey drum pattern, gong riffs and an orchestra like piano harmony that rises but never falls. Fuse ODG turns the dance number into a love song delivering lines reminiscent of warm nights spent with his love interest. His preppy melodies make the single listen like a love letter coming to live. 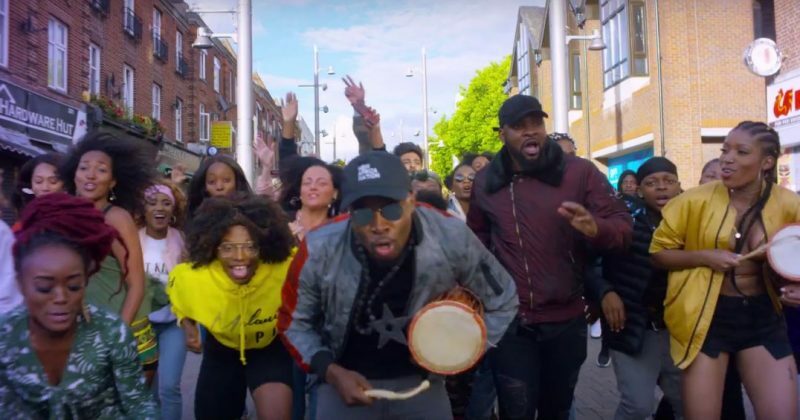 The video for “No Daylight” is ironically set on a bright summer day in London where Fuse and his New African Movement took to the street for a flash mob dance performance. Their choreographed steps are so delightful that passersby record them on their phones and the director includes them in the shots cause of the videos loose narrative. The Alexx A directed video stays true to the song’s cheerful melodies and lyrics of, “Everything Is Too Okay Right Now/ Yeah Yeah” through the rainbow colored filters and bright coloured clothes that feature ankara prints. Watch the energetic video for “No Daylight” below.